Our urologists specialise in the management of female and male urinary incontinence. Make an appointment to discuss your treatment options. We specialise in the management of erectile dysfunction, prostate cancer, urinary problems, and male infertility. 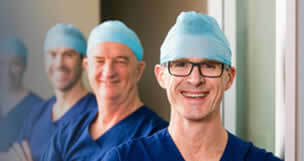 Our surgeons are highly experienced in robotic surgery for prostate, bladder and kidney conditions. Thanks for your patience while we update some of the content on the site.